The graph shows the distribution of U.S. video game sales by genre. In 2017, 11.6 percent of all video games sold in the United States were sports games. Fast-paced games seem to have been the most popular video game genres among U.S. video gamers in 2016. The most purchased genres were shooter games with 27.5 percent of all bought games, followed closely by action games. Third place was taken by role-playing games with 12.9 percent. Since a 2008 peak in physical retail sales of interactive games, which brought approximately 11.7 billion dollars to the U.S. economy, the dollar sales figures have been declining and the latest 2015 results report sales of computer and video games at a level of 5.31 billion U.S. dollars. Category breakdown shows that computer games accounted for nearly 3.11 percent of the entire figure, while the rest was attributed to video games. Furthermore, formats such as subscriptions, digital full games, mobile apps and similar, increased sales totals by additional 9.9 billion U.S. dollars. 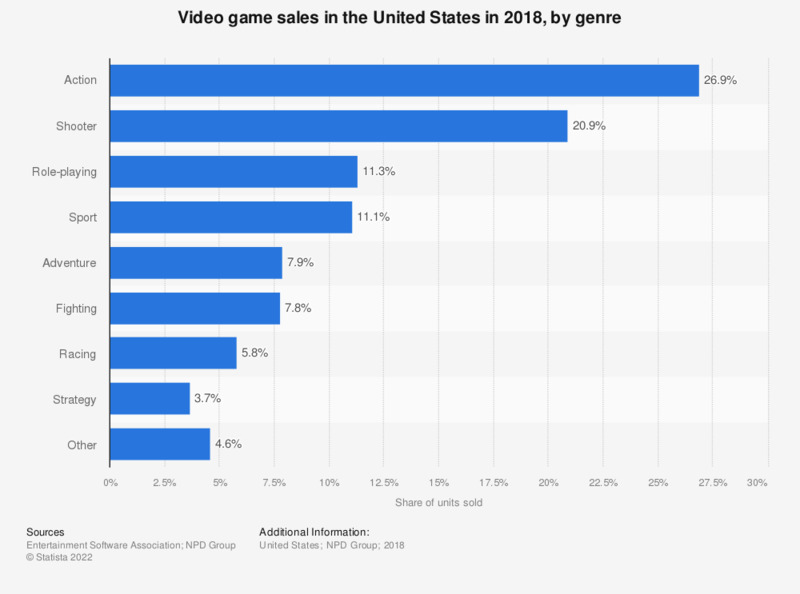 In general, as much as 31 percent of total retail sales in 2015 was generated from games delivered in physical format, and 69 percent was generated from games delivered in a digital format. One year later the physical vs. digital format sales ratio changed to 26 vs. 74 percent. The U.S. games market accounted for nearly 23 percent of the entire global market, which was worth over 71 billion U.S. dollars in 2015. In comparison, the value of the Chinese market was valued at 9.15 billion and the Japanese gaming market was estimated to reach 12.06 billion dollars that same year. On the global level, console and online games were, and are expected to continue to be, the most important revenue sources for the industry.